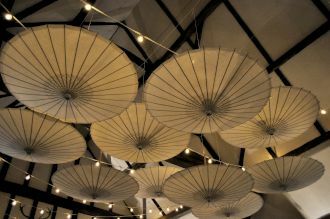 These hanging umbrellas made an eye-catching centrepiece over a cosy seating area for a Berkshire barn wedding. We installed the umbrellas hanging underneath a canopy of warm white festoon lights zig-zagged along the barn. The lights gave a lovely soft light to the barn while the umbrellas made a feature of the central seating area. Combined with a set of our wireless, remote controlled uplighters the lighting scheme transformed the barn into the ideal venue for the afternoon drinks reception followed by the evening party. Get in touch for a quote or to discuss lighting options for your event. Just wanted to say a massive thank you for providing the festoon lighting at Tudor Barn for us last weekend. All the guests were so impressed and we were very pleased with how they made the room come to life. They looked fantastic.